Yesterday the girls spent all morning playing with their tiny Ghanaian friends. I printed them out from this site HERE, and the girls are having a blast. It's our warm-up to a project they're doing on Ghana for our local homeschool International Fair in March. They were so excited to start the project, and who am I to hold them back. Their enthusiasm is contagious. Each doll has been named a traditional Ghanaian day name, which seems to have everything to do with the day of the week you are born, using this site HERE. We may decide to adopt our own Ghanaian names for a day. I've been checking out my options, and apparently as a Thursday child, I'm something akin to "a big rock in one's pocket." Is that a good thing? 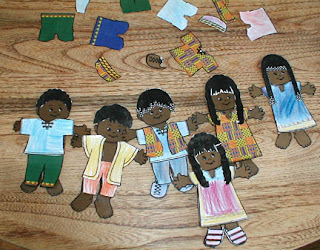 We also spent some time crafting our own Flat Stanley dolls. Flat Sunburst and Flat Rosemary! are packed up and ready to travel. First stop: Moxy Jane's kids in Austin, Texas. I can hear them giggling in their envelope, giddy with anticipation. Last night I tripped over the baby gate in our hallway. It was one of those teetery falls, where there's time enough to work up a surge of adrenaline trying to right your balance. In the end I didn't go down, but I banged my leg on the gate pretty hard. Luckily though, it was an all new part of my leg, and not the pre-injured portions. It still hurt though, and my heart was pounding, and my breathing was shallow and fast. Just imagining the pain I could have been in, for a split second the idea of reinjuring my injuries, freaked me out. And I crouched on the floor in the hallway panting. Moonshine saw everything and ran to me, showering me with a dozen kisses. "Are you okay, Mommy? Did you get hurt?" "Yes, I'm okay, just a little scared," I told her. "The kisses really help." She looked between me and the gate and back again, and in her matter of fact voice informed me, "Well, it's not badder than a car accident or anything." As you know things have been a little kooky over here, and we've been really struggling trying to get our rhythms back in place. Everything depends upon that rhythm- our ability to function in the world, stay focused on tasks, and communicate clearly and humanely with one another. Clearly and humanely. I always had assumed that would be the easy part... but when our rhythms are out of whack, nothing is easy. Nothing is clear. And I find myself suddenly at the end of the day wondering how did we get here? Rhythm, to me, depends primarily on two things: food and sleep. Regular and consistent mealtimes are easy. I watched my kids to see when they get hungry, and I began to anticipate that hunger. We eat every 2-3 hours. I don't know if that's normal or not. But that's when we're hungry. You can set the clock by it. 9, 12, 3, 5:30, and 7:30. Sleep, on the other hand, is less easy. 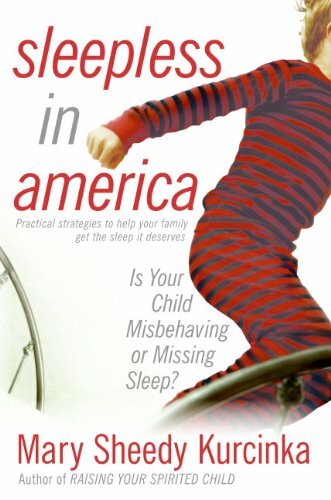 When Sunburst was a wild and energetic one-year-old who fought sleep with an iron fist, it astounded me how our neighbor's same age child would easily nap twice a day and be back in her room for a 6:30 bedtime. We struggled with sleep issues for years, but eventually we moved past the iron fist business and got on with life for the most part. This past November, our sleep patterns fell apart all over again. A solid month of houseguests, a car accident, illness, holiday fervor, and an injured Mommy who couldn't physically get it together to do the normal bedtime routine turned us all into sleepless wrecks. Normally, I climb in bed with them and we read for 30 minute stretches before the singing and other Mommy voodoo. For the first couple of weeks, I couldn't physically climb into their bed. The nightmares and pain had us up and down all night. One sleepless night led to another and the whole system crashed. In a moment of complete desperation, I picked up this book, recommended to me by the wise Aleisha. I can't say enough good things about this book. It had me crying by page six. I'm not saying that I wasn't bone tired and emotionally fragile, because believe me, I was. But it opened my eyes to thinking about sleep and parenting in a whole new light. And we're sleeping again, for the most part. But even when we're not, because life is always happening, it's like my brain is more attuned to what's going on. I can see sleep issues as sleep issues rather than plots to overthrow my sanity. I can cut us all a little more slack, and the rhythm can still flow through us. And so at last we're back to being mostly humane, functioning people. Who knew? 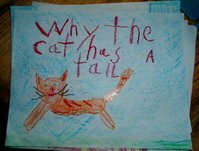 Last night was our local homeschool Science Fair, and we didn't go. We could have given quite an interactive presentation on GERMS and the spread of influenza. Instead, we opted to stay home, blow our noses, drink hot tea, and reminisce about last year's Science Fair, otherwise known as, the time Sunburst built a nest and Moonshine laid an egg. It all started when we decided to partake in the Great Backyard Bird Count. All that winter bird watching inspired Sunburst, then age 6.5, to think about birds and nests. She had lots of questions, and we checked out a pile of books from the library. She was fascinated by the idea that birds make their nest out of almost anything, and she decided she would try to build a nest, too. How hard could it be? And which materials would she use? 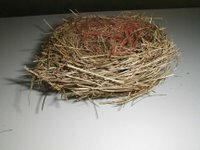 Coincidentally, we happened to find a REAL nest that had been dislodged from it's usual place, probably by a gardener or a strong wind. Sunburst brought it along as part of her display, although it was teeming with mites. Naysayer #1: "Ewww, that's too gross! Who would eat a nest?" Sunburst (grinning madly): "Well, they eat it in a soup, called Bird Nest Soup." 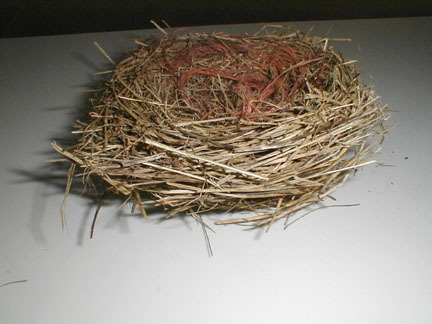 Naysayer #3: "People eat nests? In soup? I don't think this is true. How do you know about this?" Sunburst: "Yes, it is true. I read about it in a book." Obviously poop and spit were a huge hit and she had the whole crowd giggling (even the parents!) She was very cute. Moonshine, then 3.5 years, not to be left out of the fun, decided that her contribution would be an egg. 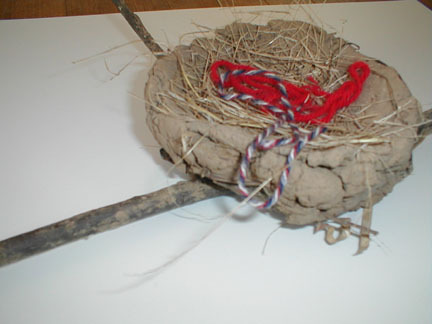 She crafted this one out of playdough. It was their first learning fair, and they've been hooked ever since! *That's a lot of neat handwriting for a 6.5 year old. To help Sunburst make it happen, I lightly penciled in the larger words and she went over them with a marker. 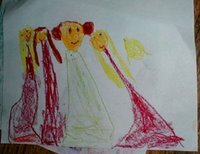 She drew the pictures and glued on the "stuff." To simulate poop, she painted a dry chunk of TVP with acrylic paint. The gross factor prevails every time. 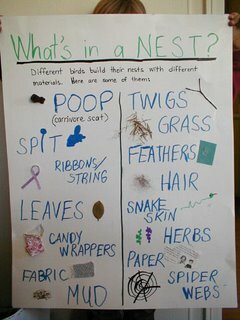 We're having some more off-time over at our little homeschool. I managed to pass that nasty flu-bug to each of the kids, and they've been coughing their heads off for the last two days. Anything that looks even remotely like school is out of the question, unless, of course it's some kind of a game. Enter Kitty Bill, the tiny mastermind. He has been taken with the Langwister cards and has begun distributing them throughout the house. Both his placement of the cards and the successive attempts to clean up said cards has prompted further game play. We used this verse from A Child's Seasonal Treasury. We'll step across the stepping stones to reach the other side. Today, the girls pulled themselves together enough to play "Cross the River" with me, and they had a fun time and completely forgot to cough for a few minutes. It was great. 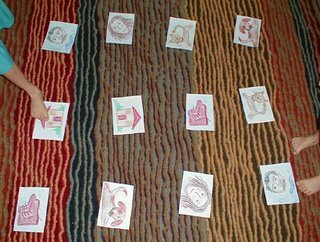 We spaced the cards out like stepping stones across the rug in our main room, and in order to "Cross the River" we had to call out the name of the cards before we could step on them. In German, of course, although I watched Moonshine do it in English and it seemed just as challenging to her in either language. I wonder if that has something to do with her age and general dreaminess. It never occurred to me before that four-year-olds would need to stop and rifle through that filing system in their brains to come up with a word they so obviously know in their native tongue to match it to a picture. It was interesting to observe. When they're feeling better, I'd like to take this game to a more social, cooperative level with them. Give them the stack of cards and a task (ex. Get from Point A to point B without touching the floor.) And then let them use the cards as they need them. Maybe give Moonshine a couple of "magic" cards (like free spaces) so she can hold her own. It would be great to have more kids to help problem solve, but for now, we'll just have to work with what we have. I was also thinking that the stepping stones idea would work well for math sums. I like the idea of having a sum on each card, and then they have to announce a problem for it (ex. "16" on the card, and they can say "10+6" or "2x8" or "20-4".) From whole to parts. I bet that would be fun. The other game, the picking up game, doesn't have much to it. The cards are tired and they want to sleep. 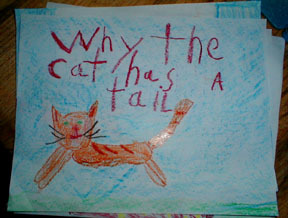 So the kids need to collect the cards, "Die Katze ist müde." "Guten Nacht, die kleine Katze." And so on... I'm learning if you say anything with enough enthusiasm it catches like fire. Yesterday, as I was languishing on the sofa after being taken down for the count for the last few days by a throat so sore and swollen that my entire head throbbed and I couldn't swallow my own spit without painkillers, I got an idea. Anyway, I had been thinking about our foreign language lessons, if you can call them lessons. This past Fall we had been singing songs and doing finger plays, but not much else. I was hoping to jump back into language lessons after our extensive break, but jumping back into the same songs, the same plays, all seemed stiff and forced and boring. If there's anything that has occurred to me since our big car crash experience, it's that there's no going back. Life is always changing. All of us are in a perpetual state of metamorphosis, and our homeschool needs to reflect that. We can use the old to create the new... but we can't go back to "exactly the way it was." This afternoon I spent some time at the dining room table drawing with beeswax block crayons. Then I took my artwork and fed it through the copy machine onto cardstock, cut them out, and did some faux lamination with clear packing tape. Then I threw them on the floor. The end result? Language + Twister = Langwister. 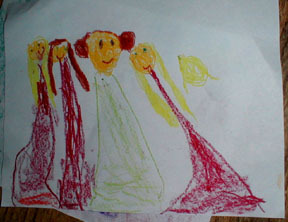 The girls and I played Langwister for about an hour. We played a very simple version. Just hopping from picture to picture this time, feeling out the experience. First I called out the words in English, so they got the hang of it. Mother, father, dog, cat, shoes, house. We did it slow. Then fast. Then faster. This was fun enough they thought. Then, to switch it up a notch, I called them out in German. Mutter, Vater, Hund, Katze, Schuhe, Haus. That was better, they thought. It made them think a bit. Bonk into each other. Laugh. Then, I cranked it up again and called them out in Spanish. Madre, padre, perro, gato, zapatos, casa. Whew! Craziness. Chaos. And funny, too. I just wanted to see. How does this work? Is this a viable language lesson? Is it fun? They seemed to like it. I plan on adding new pictures to the mix over time, as we progress. We'll craft a spinner and throw in hands with the feet, and really get that Twister-effect going and see where that takes us. I'm hoping they will want to help make the pictures. They were so curious about what I was doing today that they finally brought their own paper to the table and started drawing right along side me. Moonshine made this picture. It appears as if she has started experimenting with hairstyles, and I'm not surprised. Sunburst got right to work on a new book, which she then narrated and presented to her father at dinnertime tonight. 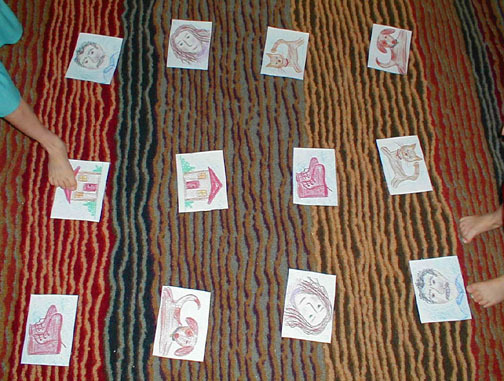 And then Moonshine pulled out the Langwister cards and spent an hour matching them up and playing Memory with them... Even Kitty Bill got into the fun and grabbed at the mother card and cried out, "Mama! Mama!" The boy knows what he likes... of course he calls Einstein "mama" all the time, so what do I know. And the blue sky over him." Can you tell what we're working on? We've jumped feet first into a new block to start off the New Year. 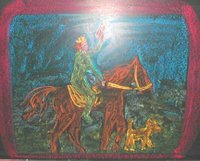 Padriac Colum's The King of Ireland's Son. So far, we love it. We're entranced and addicted and on the edge of our seats. Treachery, enchanters, killing, magic, and true love. And we're only on page 30. We can't wait to hear what happens next. It's almost painful to stop and draw pictures and write little sentences to go along with them. But we could both use the artistic outlet, so we're making an effort to go slow and build that anticipation. Strengthen the will and all of that. Have our cake and eat it, too. Meanwhile Sunburst hasn't had her fill of the Anansi stories. She's been retelling her favorites to anyone who will listen, and then, she's reinacting them - sort of. All on her own. No prompting necessary. Let the grand trickery and scheming commence! Yup. She got me. 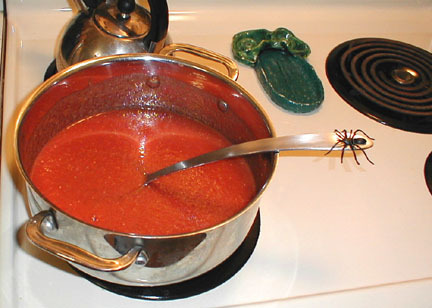 Anansi and the Tomato Soup.